In 1967 Alan Burdett started his martial arts training at the Midland PCYC, Perth, Western Australia. Over the next 4 years Alan practised a number of Martial Arts including Weapons, Ju Jitsu, Judo and then the Goju Style of Karate. It was in 1969 that Alan devoted himself to the Goju Style of Karate and attained his 1st Dan Black Belt in 1971. In 1972 Alan shifted from Perth and established the first Goju Club/dojo in the South West City of Bunbury. In 1974 he travelled to Japan and trained for four months with Master G Yamamoto of the I.K.O. International Karate Organization. Alan was graded to 3rd Dan at the completion of his training. 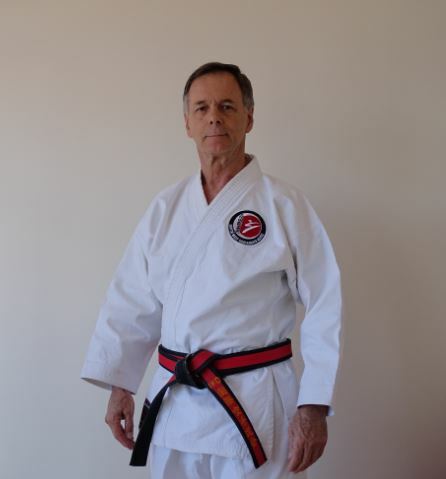 In 1981 through Alan's guidance, and, an introduction to Paul Starling of Sydney, the South West Goju Ryu Karate Do Association was accepted into the IKGA International Karate Do Goju Kai, part of a world wide Goju Kai Association under the Yamaguchi banner. The National Coaching Accreditation is another of the many courses which Alan has completed giving him a wide experience in both traditional and sports karate. He has also gained experience in judging karate tournaments. To keep up with his personal training Alan again travelled to Japan in 1982, and 1989 where he was graded to 5th Dan by Goshi Yamaguchi Chief Instructor for the IKGA. Alan has also attended many seminars and training camps in Australia and has travelled to Europe and England to attend summer camps. The South West Goju Ryu Karate Do Association continued growth lies in Alan's administrative skills, teaching ability and foresight in forming the Association into a strong group of dedicated instructors and students. All of the instructors have been personally trained by him and have completed the National Coaching Accreditation Course which is recognised by the government. In 2009 Alan traveled to Japan to train with the I.K.O. International Karate Association under Mr G Yamamoto 10th Dan. Alan was graded by Mr G Yamamoto to 7th Dan a very high position in the Goju style of Karate. In 2013 Alan was graded to 8th Dan by Yamamoto So Shihan while he was in Sydney coaching senior IKO Instructors and students.